Is a Dirty AC Costing You Money? Few things affect an air conditioner's efficiency more than air flow. Why? An air conditioner is either off or on — if it's on, it's using the same amount of electricity no matter how much air is passing through it. When air flow is reduced, your air conditioner is able to cool less air at a time. That means it has to run longer to reach your desired temperature, and running longer means it's using more electricity. Low air flow is usually caused by one thing — dirt. When part of your air conditioning system is dirty and clogged, it's affecting your air flow just like a hose's water flow is affected when you bend the hose. Below are the top three choke points in an air conditioning system. Air filters. Everyone hears change your air filters monthly, but most people still procrastinate. Mark your calendar — the cost of a replacement filter is less than the added cost of electricity from efficiency lost due to a dirty filter. Also make sure you know where all of your filters are. Some homes have more than one — maybe one for each floor or one filter just inside the intake vent and one filter right by the blower unit. Homeowners often make the mistake of diligently changing one filter and never knowing that a second filter is clogging their system. Evaporator coil. The evaporator coil is a metal device that looks kind of like a storm drain but with much narrower openings. Your air is cooled by passing through these coils while refrigerant runs through them. 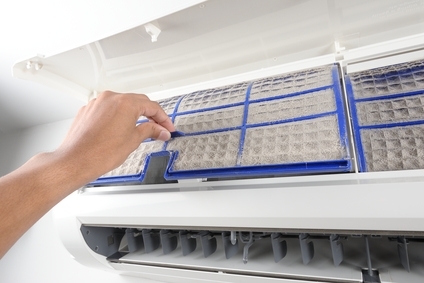 Over time, the gaps in the coils where air passes through can become dirty and clogged especially if you run your AC without a filter or don't change it frequently enough. Schedule a cleaning at least every few years to keep air flowing freely. Blower wheel. The blower wheel is the fan that pulls air through your air conditioner. Unlike a ceiling fan, its blades are very close together. Over time, these blades can become caked with dust that either passed through your air filter or floated in from your air ducts. Like with the evaporator coil, keeping a clean air filter will help keep your blower wheel from becoming dirty, but you should still schedule an inspection and cleaning every few years for peak performance.